You can donate via PayPal, Wonderful or BT My Donate using a credit card. We prefer Wonderful or BT My Donate as every penny you donate comes to the charity. At Taylor's Rehoming Centre we often have pregnant animals bought into us; whether it be cats, rabbits or guinea pigs. We would love to be able to fundraise enough money to purchase an ultra sound scanner for ourselves. The ultra sound scanner would enable us to investigate whether the animal is pregnant. This would mean that we wouldn’t need to send the suspected pregnant female to the vets to be scanned before being neutered. This would mean the animal would have a less stressful experience before the birth. We are looking to raise £1,000 for the ultra sound scanner so all donations are very gratefully received. Unfortunately, on the 27th September 2018, we had to put our beloved Sharpie to sleep. He was old boy who had had a great life as our head receptionist for 4 years. Sharpie came to us on the 9th March 2014 with severe cat flu and he became our receptionist and called Taylors his home for the rest of his life. Sharpie had become increasingly ill and he no longer had a good quality of life, so we made the heart breaking decision to put him to sleep. As you can imagine this is very hard for all the staff and all that knew him. Thank you to everyone who met Sharpie and gave him cuddles and love. We are in desperate need of more donated cat food for the residents at Taylor's. Can you help? Our cats are fed exclusively on Whiskas and Felix, as using a variety of cat foods can upset their tummies. If you could possibly donate a few cans or pouches, we would be extremely grateful. Food can be dropped off at Taylor's, or at any of our Charity Shops in Dorchester, Bridport and Sherborne. If you live too far away, you can donate cat food money by PayPal - just remember to send us a message to say that's what your donation is for. Thank you very much! If you would like to treat our animals please buy them a little pressie - you can have it delivered straight to Taylor's. Be sure to email us and let them know it's on the way as they would love to say Thank You! Can you help our cats & kittens feel snug and safe, whilst they await a new home. 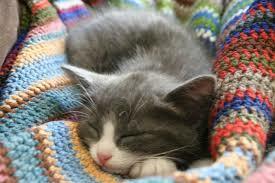 We need knitted or crocheted blankets for the cats to curl up on in their cat beds. Ideally they should measure 1 metre square (2 1/2 - 3 foot) so that they cover the whole cat bed or shelf. The blankets can be any colours and made out of any type of wool. A lot of the blankets that people make for us are made up of knitted squares and of all types of odd wool. We are always in need of lots of blankets, as they only have a limited shelf life, as they need to be washed at high temperatures to kill any germs, and can get quite furry after a while. Out of all the animal bedding we have here, these are what our cats prefer!!!!! If you can't knit, and would like to donate any wool for others to make us blankets, then please contact the Centre on 01305 259672 or call into our shops in Dorchester, Bridport and Sherborne. DO YOU HAVE ANY UNWANTED JEWELLERY, FOREIGN CURRENCY, CD'S, DVD'S, MOBILE PHONES, SAT NAV, MP 3 PLAYERS, DIGITAL CAMERAS, HANDHELD GAMES CONSOLES OR EMPTY INK CARTRIDGES? Do you shop at Amazon, or other popular online retailers? Please take the time to register, they only need your name, email and password. Follow the simple instructions on the Easyfundraising website and part of the profits of your online shopping will be donated to Taylor's Rehoming Centre.